$69.99 Approx Check Latest Price! The 10th place for best tripods for Dslr 2016 goes to the ravelli APGL3 professional 66-inch three axis head camera video photo tripod. 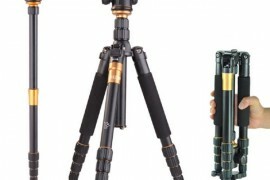 This is one professional quality tripod and certainly the sturdiest for the price it comes. Gearless and hassle-less centre elevator does the job and the centre column can be reverse mounted to get extreme low angle shots. Three-axis tilt adjustment head again brings you the fine tuning capability for orientation. Legs stretching upto 66 inches are enough to satisfy the tallest of the shooters. Quick release leg-locks make the operation snappy enough without asking much of your precious shooting time. 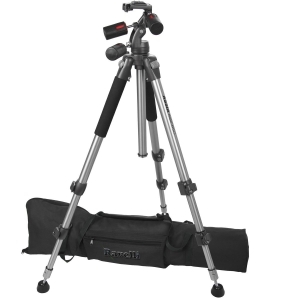 Includes a carry bag which is again a bargain for the price this tripod is being offered. $64.45 Approx Get Latest Price! 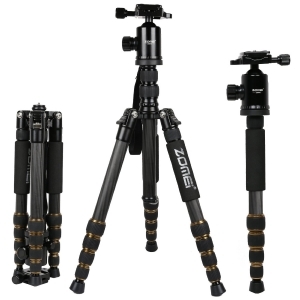 On the ninth place in the category of best budget tripods for Dslr cheap under $100 we have enlisted dolica gx650b204 proline gx series 65 inch aluminum tripod and ball head combo for dslr. 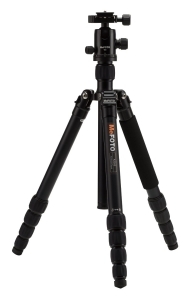 This tripod comes with what they call “rapid stability centre column” which is of non-rotating type. Also the centre column can be mounted in reversed orientation. Flip leg locks appear durable enough to me. Non slip rubber feet is a nice add-on in this price range with retractable spike. Integrated bubble level helps to position this tripod very precisely. Legs can be adjusted to 4 angle positions for more control. Dual purpose counter weight hook that can also be removed to mount the head instead. Includes a compulsory tripod carry case. Warranty on this tripod is 5 years as claimed. $64.99 Approx Find Latest Price! 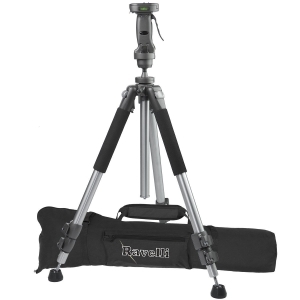 For the 8th place we have chosen the ravelli apgl4 new professional 70″ tripod with adjustable pistol grip head. The best feature on this tripod is no doubt it’s pistol ball grip mount. Super easy to position in all the desirable orientations. All aluminium construction does add a certain amount of weight to this tripod but it’s a fair trade-off for the super solid rock like construction quality the new ravelli apgl4 offers. Carrying bag is there for the travel happy folks. Oversized dslr/video camera mounting plates invoke extreme confidence. $54.99 Approx See Latest Price! 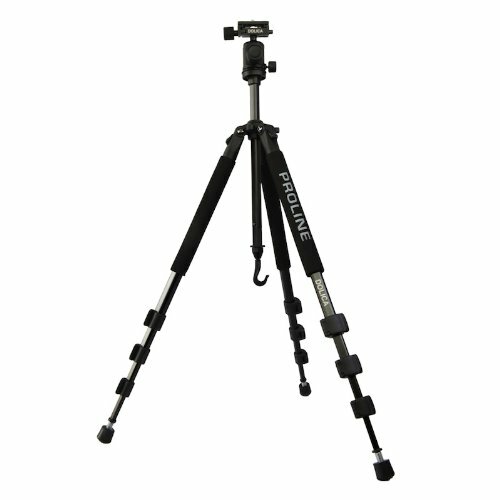 Featuring proudly at the seventh position for today’s list of top 10 best tripods for Dslr in 2016 is dolica ax620b100 62-inch proline tripod and ball head. 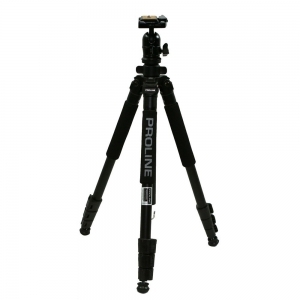 62″ tall aluminium dolica proline tripod is no less than it’s rivals both in terms of quality and portability. Infact it wins over ravelli in terms of overall weight that does limit the portability factor a lot. Support up to 13.2 pounds which is not a lot on paper but enough for most photographers in my experience. Ball head, a nice quick release plate and bubble level leave no room for complain in this tripod. Quick release leg locks coupled with non-slip rubber feet again makes you feel like owning a pro tripod for beginners price. 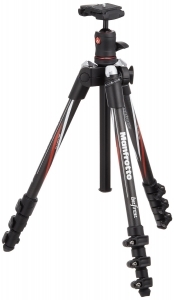 On the 6th spot we have the manfrotto befree compact aluminium travel tripod for the best tripods for Dslr beginners under $200. Light weight, compact design and manfrotto mark is enough for most photographers to lend a keen eye to this candidate. Supports up to 8.8 lbs which does not leaves any considerable margin for gear expansion or heavier lenses but serves well for majority folks. Designed to fit into airplane carry-on luggage and backpacks, makes the manfrotto befree aluminium tripod a worthy candidate for frequent fliers. $149.34 Approx Check Latest Price! 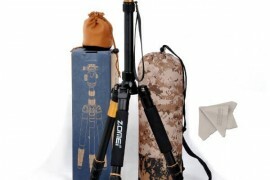 The 5th place goes to the zomei z669c portable carbon tripod monopod kit. The newer upgraded version of this tripod now has the better rigidity, higher shock absorption, better resistance to heat and corrosion. 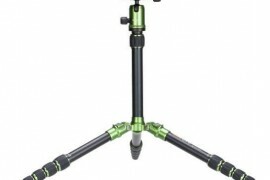 One of the leg can be mounted on the centre column separately to be a handy monopod. For a cheap Chinese tripod this one is solid with dependable construction and higher endurance. It’s supplied ball head is perfect for small to mid size DSLRs and digital cameras. The fourth place in the category of top 10 best tripods for Dslr to buy in 2016 has been earned by mefoto aluminium roadtrip travel tripod. 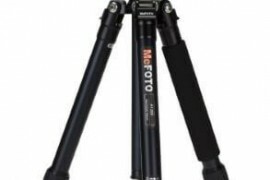 Read Complete MeFOTO Aluminium Roadtrip Tripod Review.. Accurate panoramas can be easily staged by using the awesome graduated panning scale on this tripod. 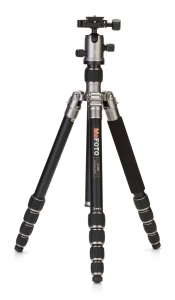 Limited by it’s two angle positions for legs mefoto is not the most versatile tripod among the list. Separate Head and Pan Lock, integral bubble level, five leg sections and a centre column hook to add extra weight do translate into finer adjustments and added stability. The highly appreciated precision matched Q Series ballhead and arca-swiss quick release plate is there for you. Mefoto is durable with it’s weather and dust resistant coating. $249.99 Approx Find Latest Price! For the 3rd place in the mash up of top rated best tripods for Dslr camera in 2016 we have chosen the mefoto aluminium globetrotter travel tripod kit. 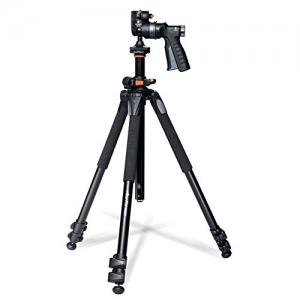 The GlobeTrotter tripod boasts its conversion capability into a full size 64.2 inch monopod. While the globetrotter itself only weighs just 4.6 lbs, but it can support up to 26.4 lbs of mounted load (best in class). 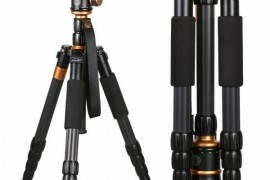 Large lens and Dslr owners will find this tripod particularly handy one. Rubberised locking knobs, anti corrosion and dust-proof design easily distinguish it from it’s rivals. For dslr video shoooters the precision matched Q series ballhead and exclusive arca-swiss style quick release plate resists uneven pans. Now get accurate panoramas with 360-degree panning and separate pan and head locks. Comes with a mandatory carry case. Globetrotter is backed by MeFOTO’s 5 year warranty. A tricky 2 years at purchase + 3 years after registration setup. $219.99 Approx See Latest Price! 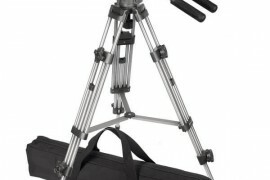 The runner up is vanguard alta pro aluminum tripod kit. Highly customizable 26mm 3 section alloy legs have the capability to adjust to a 25, 50, and 80-degree settings. 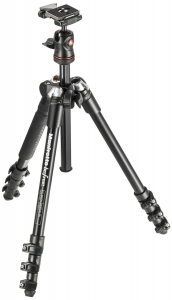 Extreme low angle photography is one of the key feature this tripod offers at a premium price tag. Pistol grip ball head is known for it’s quick single-handed camera manoeuvring. The accurate friction control system also helps you to do those little precise adjustment. Hexagon-shaped non-rotatable central column can move horizontally from 0 to 180 degrees. The patented Instant Swivel Stop-n-Lock (ISSL) System on the vanguard alta pro securely positions the central column in one simple movement. Premium magnesium die-cast canopy, thoughtful anti-shock rings and rubber feet with retractable spikes have been taken care of by vanguard. Camera loading capacity up to 13.2 pounds is pretty much self explanatory. Folded height is 28.5 inches (could have been better) and fully extended height is 68.5 inches. $306.99 Approx Get Latest Price! Finally we have the winner as the manfrotto befree carbon fiber tripod with ball head for the top 10 best tripods for Dslr 2016 mash-up. Snappier aluminium flip leg locks allows you to setup this carbon fiber delight instantly without letting you waste much time. Befree is highly compact in this category and weighs only 1.4 kg (super light 3 lbs), and can be squeezed to a tiny 40 cm (15.7 inches) set-up when folded. 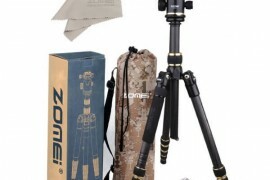 For a carbon fiber tripod this one has beautiful eye-catching graphics and a very premium looking Italian design. One good thing about this tripod is that it is compact and portable without actually compromising on sturdiness or stability. The dedicated travel backpack or befree messenger bags are built to squeeze this dependable buddy for travelling.